Yung Yuen “Norman” Hsu fell down in a train going east and couldn’t feel his legs. He was helped off the train and later arrested in St. Mary’s Hospital in Grand Junction, Colorado where he is today. Authorities are guarding Hsu’s room to keep him from fleeing… again. When medics arrived, sources said, Hsu was in the bathroom. He was able to walk off the train himself, but seemed disoriented. After being alerted to the businessman’s whereabouts by the FBI, Grand Junction officers took custody of Hsu, who was in a hospital gown in a bed in the emergency room, making sure he stayed put until G-men arrived, police spokesman Sgt. Lonnie Chavez said. Hsu remained under armed guard at St. Mary’s Hospital last night. Hospital spokeswoman Kim Williams said Hsu remained in fair condition, but she would not describe his ailment. FBI representatives said Hsu would face extradition to California when his health permits. Hsu was traveling on the California Zephyr train which left Emeryville at 9:15 a.m. Wednesday, NBC11 reported- the day he was supposed to appear in court in California. Mr. Hsu hasn’t spoken publicly since the spotlight recently fell on his fund-raising and his past. When The Wall Street Journal sought to interview him in August, he responded with an email saying he was “shocked, sad and angry that you have chosen to pick on me for NO reason.” He said that he simply wanted to pay back some of the opportunities he received in America, while maintaining a private life. …Bob Kerrey, a former Nebraska Democratic senator who is president of the New School in Manhattan, met Mr. Hsu through a mutual friend a few years ago. Mr. Kerrey declined to say who the mutual friend is. (See HERE) Mr. Hsu endowed a scholarship in his own name at the New School’s Eugene Lang College and joined its board. Last year, he became a trustee of the university. He resigned a week ago, before surrendering to California authorities. It will be interesting to see if Bob Kerrey ever comes clean about his “mutual friend” who introduced him to Hsu. Clinton donor Bernard L. Schwartz, who was allowed to transfer restricted satellite and missile technology to a People’s Liberation Army front after contributing a record amount of cash to President Clinton’s 1996 campaign, is also on the board at New School. From 1992 to 1996, Schwartz was the single largest contributor to the Democratic Party. 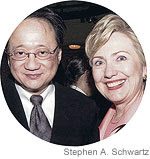 World Net Daily reported that last November, Schwartz and Hsu chaired a New School banquet at the Mandarin Oriental in New York which featured Sen. Clinton as keynote speaker. Clinton steered a $1 million federal grant to the college. Hsu was one of the top donors to Hillary Clinton’s presidential campaign. An event Hsu helped organize in Hillside, California for Hillary Clinton starring Quincy Jones is still scheduled for September 30th. Since 2004, three managers of a plastics manufacturing plant on the outskirts of this Northumberland County town have given more than $270,000 to top Democrats, including Sens. Hillary Rodham Clinton, Dianne Feinstein, and Edward M. Kennedy. What makes those donations unusual – besides that they came from a blue-collar coal town not known for large political checks – is that they closely track the pattern of giving by Norman Hsu, the self-described apparel executive and two-time fugitive who was apprehended in Colorado late Thursday. Federal authorities, according to published reports, are investigating whether Hsu used a network of associates to skirt campaign contribution limits and broaden his political reach. The exact relationship between Danny Lee, Soe Win Lee and Yu-Fen Huang – managers at Newspring Packaging in Mount Carmel – and Hsu remains murky. But when it comes to politics, they appear to be of one mind. In many cases, they have given like amounts at the same time to the same candidates across the nation, campaign records show. Danny Lee began his political giving in the fall of 2004 – about the time Hsu started writing big checks to top Democrats. Soe Win Lee and Huang followed months later. In all, they have donated $270,800 to Democratic campaigns and political action committees that support the party. On campaign contribution forms, Danny Lee and Huang listed several addresses, including a property in the Forest Hills section of New York City and a modest, one-story brick-faced home on South Beech Street in Mount Carmel, 70 miles northeast of Harrisburg. A young woman who answered the door at that address last week said neither of them lived there. UPDATE: Hsu Freaked out… Stripped off his shirt and shoes, before paramedics were called to take him off the train.